Bookmakers love it when punters bet on multis. This is because the bookies edge is multiplied with every leg that is added to the bet. For that reason, multis are generally a bad if you are a regular punter. However, if you are matched betting everything changes. Because they love multis so much, bookies regular offer promos and bonus bets on them. A smart matched bettor can use these to turn the odds in his or her favour. Whether it is a ‘refund if one leg loses’ offer, or an odds boost, by using matched betting strategies it is possible to give yourself a risk-free shot at a profit, or even to lock-in a guaranteed return. However, the maths behind these strategies can be tricky at times. That is why we have just launched our latest matched betting calculator – the Multi Promo Calculator. If a user enters their multi odds, and details of any promo, the new calculator will work out the lay stakes that they need. Depending on the method selected, the lays will either return a break-even result if any leg loses, with a big profit if the all win, or they will return an equal profit no matter what happens in the last leg. This is just the latest of our many matched betting calculators, and it provides bonusbank members with one more tool that they can use to make money online. 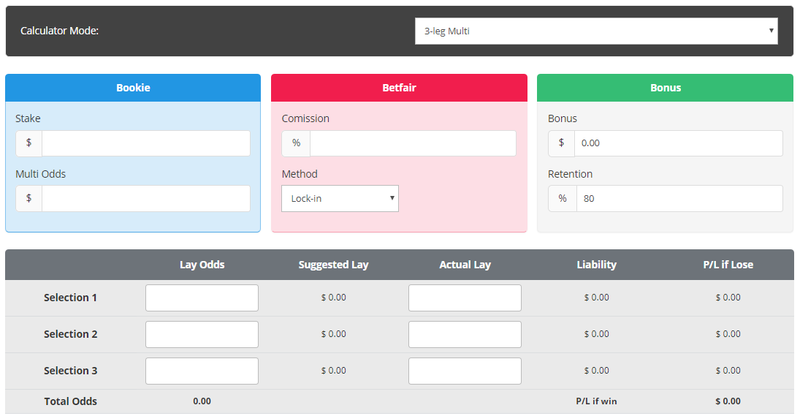 If you want to start making risk-free profits from bookmaker multi promos, signup today to get access to the calc!